Robert Wiener: La tapar, ana Sahaffi. Robert Wiener: What does it mean? Ingrid Formanek: Don't shoot, I'm a journalist. In 1991, CNN was a 24-hour news network in search of a 24-hour news story. Already around for the better part of a decade, CNN was, at the time, a sort of joke when compared to ABC, CBS, and NBC, and was dubbed the "Chickenwire News Network" by its staff as well as by their peers in the news marketplace. This would all change when producer Robert Wiener (Keaton) and his crew went in to Baghdad at the outset of the Iraqi invasion of Kuwait. The events that transpired in Baghdad would be captured by Wiener in his novel, Live From Baghdad, and ultimately in this thrilling film of the same name when it aired on HBO. Wiener and his CNN crew, including Peter Arnett (McGill), Bernard Shaw (Wisdom) and producer Ingrid Formanek (Bonham Carter), came to Baghdad with the intention of finding that elusive round-the-clock story. Upon arriving in Baghdad, Wiener's first goal is to land an exclusive interview with Saddam Hussein, and though it at first appears that he may well have a shot, it becomes clear that the Iraqi government is manipulating CNN to great lengths. Through a series of unfortunate circumstances and several defeats at the hands of the Iraqi government, Wiener and his group soon decide to return to Atlanta on the eve of the deadline imposed by President Bush. Their plans soon change when American forces begin to bomb Baghdad, and this CNN crew begins its now-famous broadcasts, live to the world from their hotel room. Live From Baghdad works best in the most basic elements of the story. The struggle of the news crew to gain the exclusive Saddam interview is exhilarating because of the sheer determination of Wiener. Keaton, in a performance that ranks as a career best, takes control and effectively portrays Wiener not as a man desperate for success, but rather determined to obtain it. There are moments where the film crosses the line from edgy and thought-provoking into glorified praise of CNN and the work of those who bring the news to the world, but for the most part the film is very smart in its approach to a career that very few understand. The script, adapted by Wiener from his novel, becomes bogged down by an unnecessary subplot involving the romance between Wiener and fellow producer Formanek. The romance angle is handled rather well with no emotionally heavy moments, but the placing of this subplot in this hard-hitting environment of cutthroat journalism feels out of place. When the film does begin to focus on the bombing and the first live broadcast by the crew, director Mick Jackson expertly blends in special effects and stock footage to craft a realistic look at the war. Live From Baghdad may be viewed years from now as a veritable time capsule, a reminder of a time when news reporters were not "embedded," as well as a moment in our nation's history when the war truly came into our homes round the clock. Image Transfer Review: Presented in a 1.85:1 anamorphic transfer, Live From Baghdad showcases a nearly pristine transfer. Colors are muted throughout, given the drab earthtones present in Baghdad, but the vibrancy evident in the rare appearance of brighter colors shows no bleeding. Sharpness and detail are perfect and I noticed no edge enhancement. The print used was flawless, with no grain or dirt evident. 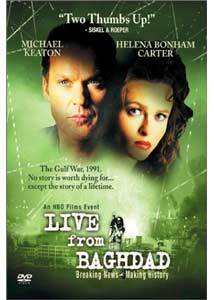 Audio Transfer Review: The Dolby Digital 5.1 mix for Live From Baghdad is largely subdued for much of the film, including the climactic bombing of Baghdad. Dialogue is crisp and clear throughout, very crisp with no distortion. The left and right speakers provide rich balance for the musical score as well as ambient effects. A nice but average mix. Extras Review: Director Mick Jackson provides a commentary track that, while worthwhile, is not as informative as I had hoped. Jackson talks at length about the production, including locations that stand in as very nice substitutes for Baghdad, as well as the casting. I had hoped for a more detailed account of the real-life events that inspired the film, something a commentary by Wiener would have supplied. Cast and crew biographies are also supplied. The timing of the release of Live From Baghdad holds an eerie coincidence with the current events that have captivated the world. As a stand alone piece of dramatic filmmaking, it is expertly acted and directed, with performances by Bruce McGill and Michael Keaton that rank as the very best of their respective careers. Recommended.